New South Wales finished their Ryobi Cup league campaign with a victory - by 49 runs via D/L method - against South Australia to secure their position in the elimination final. NSW and Victoria will face off in the elimination final on October 24, with Queensland waiting for the winner of that match for the overall final on October 27. After winning the toss at Drummoyne Oval, the NSW openers put on 30 in 4.1 overs. David Warner led the quick start with 32 off 23 balls, and after he was dismissed in the seventh over with the score on 3 for 52, Nic Maddinson and Kurtis Patterson added 101 for the fourth wicket. Once Maddinson fell on 75 and Ben Rohrer was dismissed first ball, it was left to Sean Abbott and Steve O'Keefe to keep the innings going. 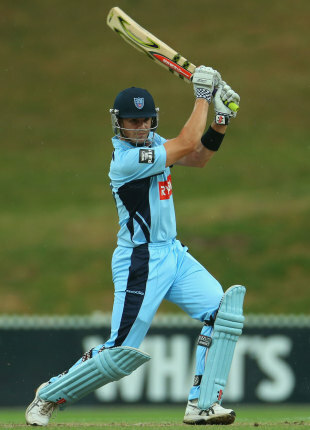 They did so with scores of 50 and 31 as NSW finished on 8 for 252 in 42 overs. Joe Mennie was the pick of the bowlers for South Australia with 4 for 58. Chasing a revised target of 248 in 41 overs, South Australia's reply started inauspiciously as Matt Weaver fell for a two-ball duck. Michael Klinger and Tom Cooper put on 73 for the second wicket but Abbott broke that stand in the 14th over. South Australia then suffered a double-blow with the score on 113, and the middle order faltered as four wickets fell in the space of 26 runs. Nathan Lyon and Abbott took three wicket each, and Tim Ludeman's 29-ball 34 was not enough as South Australia were dismissed for 198.